The qilin doesn't really resemble a western unicorn, but symbolizes good luck. The qilin or Chinese unicorn is a mythical beast that symbolizes good luck and prosperity. 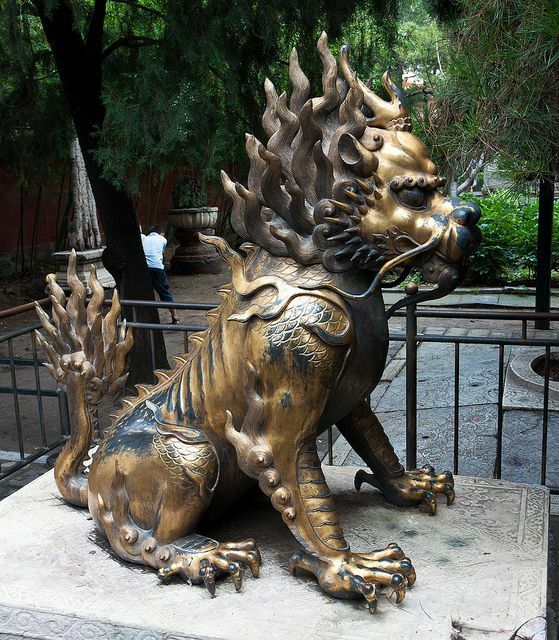 According to tradition in China, Korea, and Japan, a qilin would appear to signal the birth or death of a particularly benevolent ruler or sage scholar. Because of its association with good luck, and its peaceful, vegetarian nature, the qilin is sometimes called the "Chinese unicorn" in the western world, but it does not particularly resemble a horned horse. In fact, the qilin has been depicted in a number of different ways over the centuries. Some descriptions state that it has a single horn in the middle of its forehead—hence the unicorn comparison. However, it may also have the head of a dragon, the body of a tiger or a deer, and an ox's tail. The qilin is sometimes covered with scales like a fish; at other times, it has flames all over its body. In some tales, it can also spout flames from its mouth to incinerate evil people. The qilin is generally a peaceful creature, however. In fact, when it walks it steps so lightly that it doesn't even bend down the grass. It can also walk across the water's surface. The qilin first appeared in the historical record with the Zuo Zhuan, or "Chronicle of Zuo," which describes events in China from 722 to 468 BCE. According to these records, the first Chinese writing system was transcribed around 3000 BCE from the markings on a qilin's back. A qilin is supposed to have heralded the birth of Confucius, c. 552 BCE. The founder of Korea's Goguryeo Kingdom, King Dongmyeong (r. 37-19 BCE), rode a qilin like a horse, according to legend. Much later, during the Ming Dynasty (1368-1644), we have solid historical evidence of at least two qilin showing up in China in 1413. Actually, they were giraffes from the coast of Somalia; the great admiral Zheng He brought them back to Beijing after his fourth voyage (1413-14). The giraffes were immediately proclaimed to be qilin. The Yongle Emperor was naturally extremely pleased to have the symbol of wise leadership show up during his reign, courtesy of the Treasure Fleet. Although traditional depictions of the qilin had a much shorter neck than any giraffe's, the association between the two animals remains strong to this day. In both Korea and Japan, the term for "giraffe" is kirin, or qilin. Across East Asia, the qilin is one of the four noble animals, along with the dragon, the phoenix, and the tortoise. Individual qilin are said to live for 2000 years and can bring babies to deserving parents much in the manner of storks in Europe.